Just like when someone put a lift kit on a 2015 Cadillac Escalade, the inevitable result of Paris Hilton acquiring a C7 Corvette Stingray is eye-searing and distasteful. 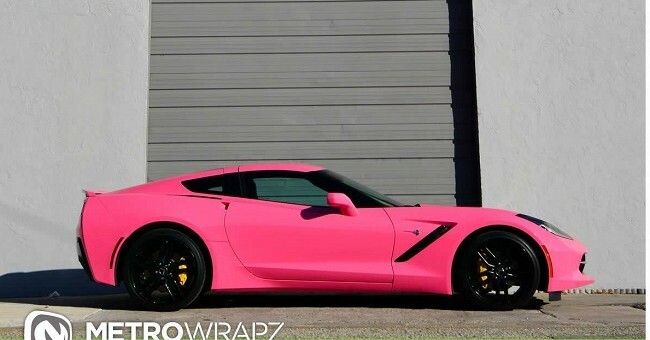 The famous socialite has a history of wrapping her cars in a Barbie-like shade of pink, and didn’t find any reason to spare the C7 Corvette from the same treatment. Graphics and signage company Metro Wrapz, who is also responsible for other questionable vinyl wraps such as a pink Bugatti Veyron and a lime green Ferrari 458, took on the task of wrapping the Z51 Corvette pink. From what we can deduct from Paris’ Instagram page (the things we do for research) the Corvette may not actually be hers, but used as a promotional tool for a Barbie-themed Miami Art Basel party hosted by Italian designer Moschino. This may not be the most tasteful Corvette on the planet, but it’s not horrible. We’ve always said the Corvette can wear almost any color, even though pink won’t be joining Chevy’s color palette for the car any time soon. Check out more photos of the Pink C7 over on Motorward, and let us know what you think in the comments. Well, hopefully the old phrase “There is no such thing as bad publicity” applies here and some of her followers buy one in a better color. I’d choose limegreen myself. I had my 3000gt painted lime green in 1995, and I loved every moment of it. You know what they say- to each their own! I mean….I can’t speak to the tastefulness of the owner, but it’s not such a bad look. Got that flat bubblegum, for a girl’s car it looks pretty badass. (Or an October NFL tie in).